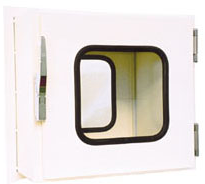 This is a pass box that is used to minimize the entry and exit of people who are the biggest cause of dust generation when delivering goods in a clean room. 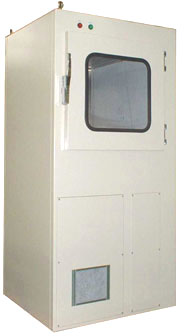 Air shower with 4 jet nozzles is added to normal pass box.Clean up the delivered goods and parts. By constantly circulating the air in the pass box, contamination inside the cabinet is prevented, and the delivered goods and parts etc. are cleaned.